The views fro m Portishead seafront include the Welsh coastline and there is nowhere better than to take in these far reaching views than Portishead Point, perhaps better known these days as Battery Point. Battery Point can be accessed from the steps that run alongside the open air pool and Lido Café (watch out for badger sett openings when you get to the top) or from the path leading from Eastwood. There are plenty of public seats here providing somewhere to stop and rest while admiring the views. The water off Battery Point is extremely hazardous due to strong currents and the high tidal range, so care must be taken and there is no swimming allowed. Close to the point you will find a large memorial dedicated to seafarers past and present who have sailed past the point. A navigational light sits right on the point where ships pass closer to the mainland than anywhere else on the UK coastline. The bell, originally used in the lighthouse to warn sailors of treacherous conditions, now sits near to the town centre, as a symbol of Portishead’s maritime history. 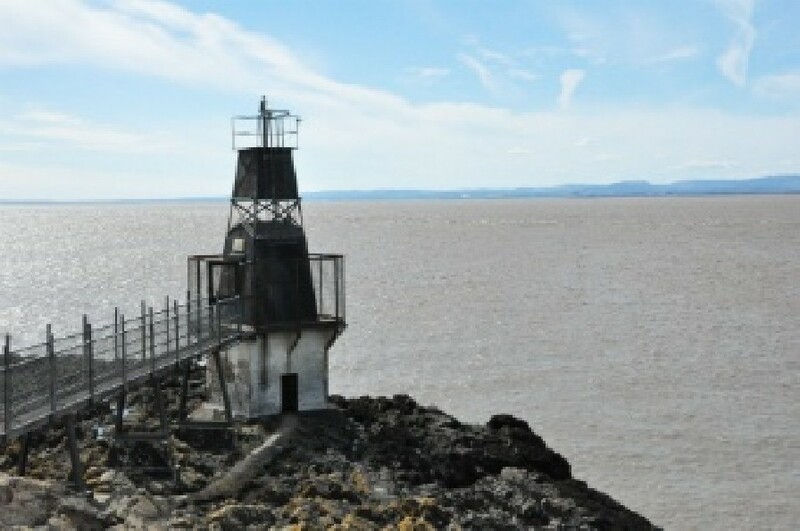 The lighthouse is currently maintained by the Bristol Port Company. Through the ages Battery Point has been an extremely important defence point. It was the site of an Elizabethan watch-tower, a Civil War battery, a Victorian coastal battery and the site of First and Second World War military coastal defences. For fishermen, Battery Point is big cod country. The water around the point is very deep, and a gentle lob puts you into a considerable depth of water. Heading back to the woodland, you will find a notice board offering interesting facts on the local history and habitat. For more information about Battery Point see also this website’s history section and ‘Battery Point Lighthouse Bell’.